One of a kind manuscript map illustrating Tongyeong, an important South Korean city and former naval fort. A scarce early 19th century Korean map of the famous naval base at Tongyeong. The map covers the old naval base, at center, as well as many of the surrounding islands and seas. As with many East Asian maps of this period there is no defined scale. More important areas, like the naval base at center, are thus presented on larger relative to surrounding regions. Similarly, with no strong established distinctions between art and cartography in 19th century Korea culture, many parts of the map, such topography and buildings are presented pictorially. Maps like this were thus not intended for practical use and were instead prepared as presentation pieces for display in government and military offices. Tongyeong, today an important Korean city and resort located at the southern tip of the Goseong Peninsula, was originally established by Admiral Yi Sun-sin as a naval bastion against the Japanese invasions of 1592 to 1598, also known as the Imjin War. Arguably the greatest naval commander of all time, Admiral Yi Sun-sin successfully defended Korea's shores against the numerically superior Japanese in repeated naval battles. The most famous of these was most likely the Battle of Hansan-do (on our map, the spider shaped island to the southwest of the main city) where Yi unveiled his legendary crane formation naval attack. The formation soundly defeated Japanese armada killing over 8000 invading marines with a loss of only 11 Koreans sailors. Battle of Hansan-do is still considered one of the greatest military battles of all time. The large island at the bottom of the map is Mireuk-do (Mireuk Island), with the sacred Mt. Mireuksan presented dramatically at its center. The mountain is named for the Maitreya Buddha, who it is believed will manifest on the mountain at some future date. The mountain and foothills have been popular pilgrimage sites since the 16th century, possibly even earlier, and host numerous temples including Yonghwasa, Gwaneumam, Dosoram, and Miraesa. This is a map of the utmost rarity. 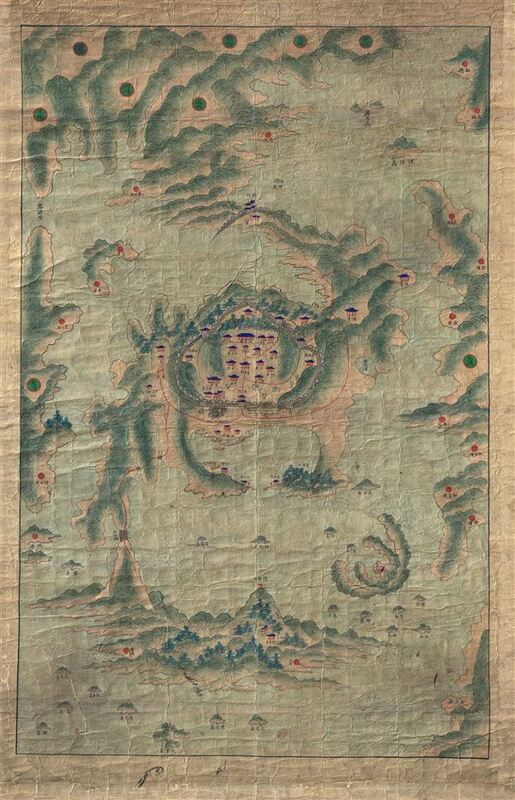 Early Korean cartographic material in general is extremely scarce, rarely appear on the market. Maps of this age and beauty are even less common. There is only one other known similar map, also of Tongyeong and housed at the Seoul National University. Our example seems to present the fort at a much earlier stage of development and therefore is most likely much older. That said, East Asian material of this period is exceedingly difficult to date because it is rarely dated and map construction methods, including inks, papers, and styles, changed little in the course of 500 years of mapmaking. Nonetheless, our analysis of this piece has enabled us to date it with some confidence between 1827 and 1850. One building on the map, identified as ChunChuk-Roo, is known to have been constructed in 1827, so the map must post date it's construction while at the same time preceding the construction of later missing buildings. Published: IMCOS Journal, Spring 2014, no. 136, Front Cover.